Note: The Lowepro Toploader 70 AW has been replaced by the Lowepro Toploader Pro 70 AW. Lowepro has replaced the Lowepro Toploader 70 AW with the Lowepro Toploader Pro 70 AW. It is even nicer than the previous model, but note that there is only one SlipLock attachment loop and the dimensions have changed. The Lowepro Toploader 70 AW is very similar to the Lowepro Toploader 75 AW. It is about two inches shorter. 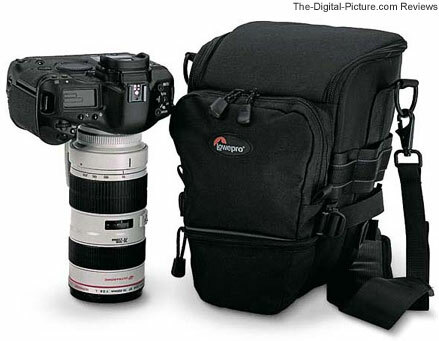 It will hold a Canon 1-Series body with a Canon EF 24-70mm f/2.8 L Lens with its lens hood reversed. Pictured above from left to right are the Lowepro Toploader 75 AW, Lowepro Toploader 70 AW and the Lowepro Toploader 65 AW.